When in a very famous restaurant, my choice always will be a risotto. 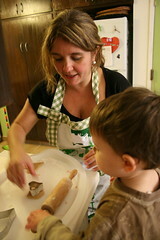 It requires patience, art and talent from the chef. 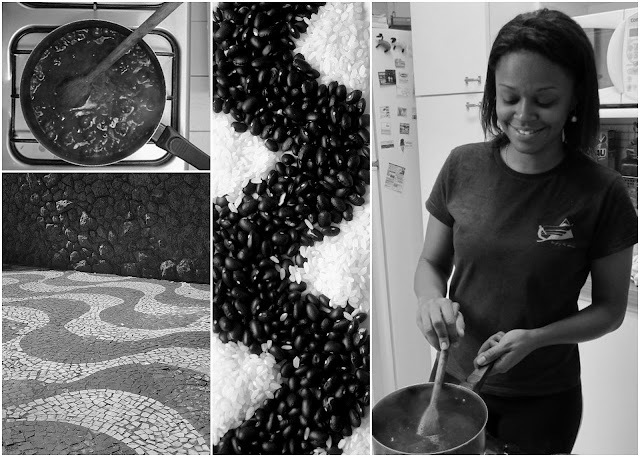 I recalled one that I could never ever forget: pear and brie risotto from one of the finest restaurants in Leblon, a kind of Gourmet Ghetto of Rio de Janeiro. This was a long time ago, but not long enough for me to forget its perfect texture and taste. After some research, I found out very similar recipes but not any that would fit my crave for a perfect choice for a girls in lunch. For dessert, a classic shortcake cookie was cut with the help of little hands. How romantic! In a heavy pot melt butter and the olive oil over high heat. Add shallots. When shallots begin to brown, stir in rice. Pour in wine and wait for the alcohol to evaporate. Lower heat and start dropping in the stock to gradually moisten the rice. Keep dropping the stock every time you see that the water is drying. Add the pears and go to a simmer. Carry on dropping in the stock and add Parmesan cheese. Meanwhile, in a hot skillet, grill the slices of prosciutto di Parma until they are crunchy. When the rice achieves a pearly appearance with an al dente texture, turn off the heat and fold the brie into the rice and integrate it slowly with a wooden spoon. 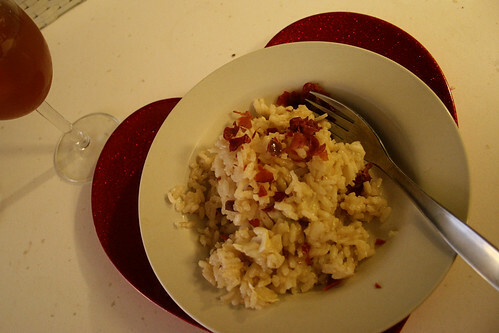 Serve the risotto in soup plates and garnish with the crunchy prosciutto broken into tiny pieces.